Stop juggling client demands that make it hard to produce creative you’re proud of. Watch the second session in our summer webinar series to learn how to manage strategic partnerships with your clients – without giving up time for the creative work you love. 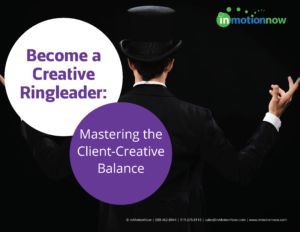 Remember, your day-to-day doesn’t have to feel like a balancing act between clients and creativity! Fill out the form to the right and get instant access to the Dazzle Clients with Creative You Love webinar and ebook! Get Access to the Webinar & eBook!